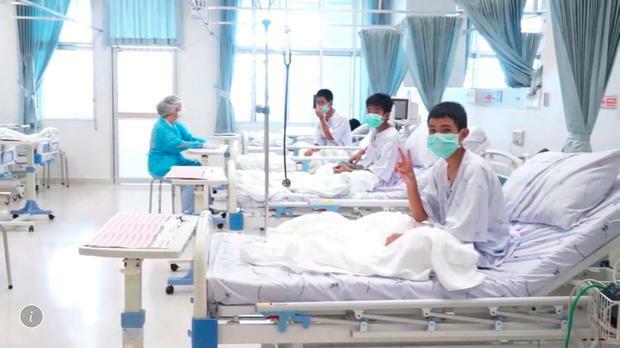 The amazing rescue of a Thai boys' football team and their coach from a flooded cave complex transfixed news viewers around the world, and the story could be headed for a retelling by Hollywood. The saga is reminiscent of the 2010 rescue of 33 Chilean miners trapped for 69 days, a tale that was turned into 2015 movie 'The 33' starring Antonio Banderas. Like the Chilean rescue, the Thai drama showcases real-life courage in the face of harrowing circumstances, said Mike Medavoy, the Oscar-nominated producer of 'The 33'. It is likely the saga will be turned into a film or series of TV episodes at some point, he said. "It's about the triumphs of individuals and groups of human beings over tragedy," Medavoy said. "It's terrific." Producers with Pure Flix, a studio that specialises in Christian and family movies, already are on the ground to conduct preliminary interviews for a potential film. "I see this as a major Hollywood film with A-list stars," Pure Flix managing partner Michael Scott said. Pure Flix did not immediately respond to requests for comment. "It's a combination of great jeopardy and great heroism," said literary agent Judi Farkas, who represented author Antonio Mendez on the film rights sale of his book 'Argo' for the Oscar-winning Ben Affleck movie. 'The 33' was filmed in Colombia and Chile and produced for about $24m (€20.5m). A movie about the Thai rescue could be made for less, Medavoy said, because filming in Thailand is cheaper. But filmmakers will have an added challenge as the rescue takes place in murky water. A big-screen production would probably take years to bring to cinemas. But the Thai rescue also could draw interest from TV networks, which could provide a quicker path to the screen. It remains unclear who the heroes would be in any film or TV version. Harry Cockburn A magnitude 6.4 earthquake struck central Philippines the day after a deadly tremor hit the north of the country. Krishan Francis and Emily Schmall ISIL claimed responsibility for the Easter bombings in Sri Lanka, as the death toll rose to 321 yesterday, and released images that purported to show the attackers.